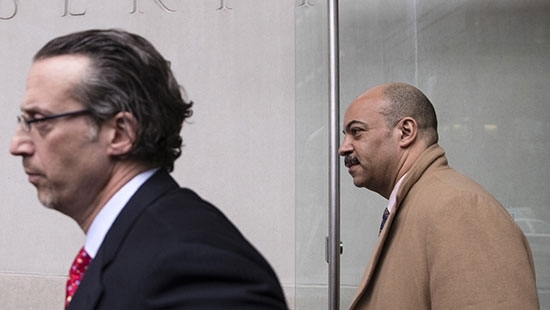 Philadelphia District Attorney Seth Williams has until the end of the week to find a new lawyer to represent him in his federal corruption and bribery case. Late last week his current attorney, Michael Diamondstein, filed a motion to withdraw. Diamondstein cited ethical conflicts and Williams' inability to afford his rates as reasons for withdrawing. He had agreed to represent his friend Williams at arraignment for free. During the two-year long FBI investigation, Williams had a lawyer paid for by the city, but lost that lawyer once he was indicted. U.S. Magistrate Judge Timothy Rice said that this was unprecedented and Diamondstein should have never signed onto the case. Williams has until Friday to find a new lawyer. "You could waive your right to counsel, or have your bail revoked. I'd be careful how you proceed. This is treacherous ground," the judge said. Philadelphia police are searching for a man who was caught on surveillance video stealing a 60-inch flat screen television from a home in West Oak Lane last week. It happened on the 6800 block of North 19th Street around 11:50 am on Tuesday, March 21st. The suspect was able to remove a window unit air conditioner and climb through into the living room. He took several credit cards and the large TV. The video shows the suspect leaving from the rear of the home and struggling to carry the screen down the alley. He is described as a black male, late 20's to late 30's, beard, medium complexion, stocky build, wearing a dark knit hat, dark jacket, dark pants, and black sneakers with white bottoms. Anyone with any information is asked to call police at 215-686-TIPS. See video below. A gunman is at large after a barricade situation in North Philadelphia earlier this evening. Police and SWAT responded just before 4 p.m. to North 17th Street near West Susquehanna Avenue. A man shot a 17-year-old boy in the hip. The boy was taken to Temple University Hospital in critical condition. Police believed the suspect had entered an apartment building on the 2100 block of North 17th Street and surrounded the building. The suspect was not found but a handgun was recovered in the rear of the property. The situation was declared over at 6:30 p.m.